On Tuesday, Feb. 5, we attended BISG’s Technology Confidential program. The panel included Rod Elder of Virtusales, David Hetherington of knkPublishing, George Logan of Klopotek, and Rob Stevens of Firebrand Technologies. 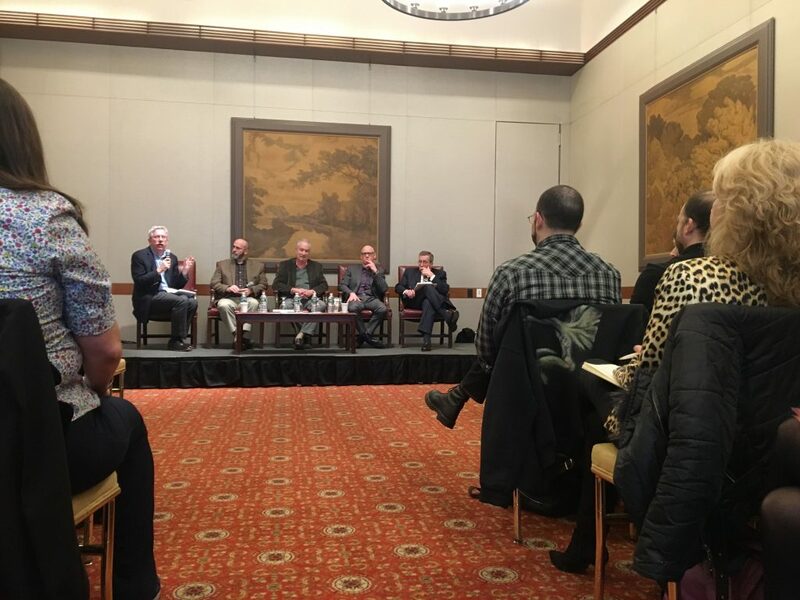 Of course, we’re happy for any opportunity to cheer on our colleagues from Firebrand, but we were also there to hear from other panelists and attendees across the industry who are focused on using technology to help publishers get their books into as many hands as possible. Virtusales, knk, Klopotek, and Firebrand all provide software to help publishers manage multiple aspects of the publishing process from title management to ONIX delivery to rights across multiple divisions and throughout a title’s lifecycle. The panelists talked about the perils of customization, challenges of changing publishers’ workflows and implementing new technologies, and the importance of clearly-defined strategies at all levels of a company. The panelists lamented the challenges of leaning too heavily on customizations. While at first it might seem like customization can streamline workflow and tailor software to the unique needs of a specific publisher, all of the tech experts on the panel cautioned against it. The panelists uniformly recommended configuring software instead of customizing. Configuration keeps the basic structure of a software while shaping it to the style specifications and some of the unique needs of an individual company. Customizing requires new code whereas configuring does not. Customization can make it more difficult for the software to communicate with other softwares, and can make system updates more difficult, resulting in patched solutions upon patched solutions. David Hetherington noted that heading down a road of customization is a road that will ultimately be longer, harder, and more expensive. This is why publishing-specific software are so important. Rod Elder of Virtusales acknowledged that publishers have unique needs compared to businesses in other industries. The solution is to use publisher-specific software rather than customizing software that is meant for a different industry to make it work for publishing. Publishing-specific software can be specific enough for the unique needs of book publishers so as not to require huge amounts of configuration, but still flexible enough from a UI perspective to fit the quirks of an individual house. David Hetherington gave the audience an acronym for thinking about workflow and technology updates: TCO – Total Cost of Ownership. It forces you to ask: What is the cost of doing things the way they’ve always been done, versus adopting a new technology to solve the problem? Say a publisher workflow includes manually and frequently enter data in multiple databases for a single title. The publisher should consider both the literal cost of employee hours spent doing repetitive administrative work and keeping a big IT team to deal with bugs, plus the more abstract cost of an employee’s intellectual or creative energy that is left on the table when so many hours of their day are taken up with data entry. The TCO for this workflow might be high enough to necessitate a change in the status quo, either by internally streamlining or by introducing new software to make the process less manual and less repetitive. Publishers tend to think about implementing new technologies only in terms of the cost of the new software and the time it takes to integrate it into daily operations. But the panelists reminded the audience that there are real costs to consider in these calculations related to maintaining the status quo. Rob Stevens of Firebrand reminded the audience how important it is to ask why you and your team do what you do. Why do you fill in that box? Why do you enter data in a specific place or at a specific time? Why does your team need that report? If the reason is “that’s the way we’ve always done it,” you might want to consider dropping that task from your to-do list, which we’re sure is already long enough! Asking why a company needs certain pieces of data can also help technology solution providers determine the best way to help meet a company’s needs or solve a particular problem for them, and can even drive development on the technology solution provider’s end. Clearly articulating the “why” can also help ease some of the growing pains of implementing new software and workflows. If all members of a team know why they are being asked to change their day-to-day operations, they are more likely to adopt the new tools and use them successfully. The success of new technologies in a publishing house largely depend on the enthusiastic adoption and experimentation by the people who are using them on a daily basis. BISG works to create a more informed, empowered and efficient book industry. Its membership includes trade, education, professional and scholarly publishers, as well as distributors, wholesalers, retailers, manufacturers, service providers and libraries. For more cross-industry knowledge and events, follow BISG on their website, where you can see all upcoming events. You can subscribe to their newsletter here. And, keep up to date with industry news, trends, and best practices by subscribing to NetGalley Insights.